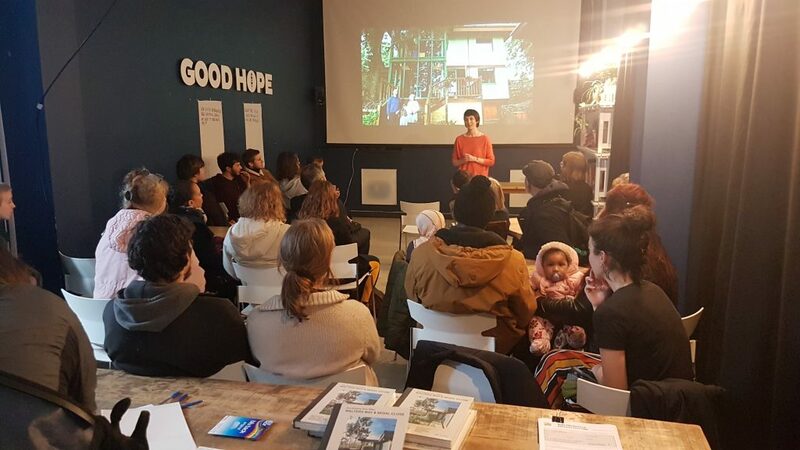 On 16th January we relaunched the RUSS Community Housing Meetings at the Cafe of Good Hope with an evening looking at the inspiration behind the project. There was a great, and diverse turn out of around 40 people – some familiar faces, and some new to RUSS. The evening began with a welcome from Kwame Lowe (Co Chair for RUSS) followed by an introduction to some of the current members, who gave an overview of RUSS. Dan de Lezameta (Trustee and future Church Grove resident) spoke about the new meetings, and the desire to attract current and potential RUSS members to get involved, and also to engage with the wider Community housing debate. Megan Ancliffe (Trustee and future Church Grove resident). Megan gave some information about the Community Hub – a single storey temporary structure (to be in place for at least 4 years) due to commence construction this year. It will remain on the site and will be a base to support residents kick starting the self-build process. This could also be a great starting point for anyone wanting to get involved – volunteers welcome. Emma Leach (Volunteer and future Church Grove resident) outlined the basic facts of the Church Grove Project, the flagship project for RUSS: there will be 33 homes comprising 35-40 residents plus children. 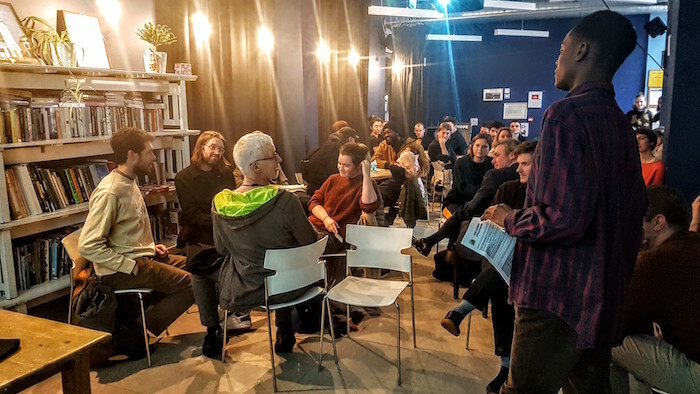 Since 2016 the residents group has participated in co-design sessions with architects, and the site now has planning permission. The next stage for Church Grove residents is skills training. All homes are currently allocated, but anyone interested is encouraged to apply as there is still movement on the waiting list, and RUSS is planning for future projects. For the second part of the evening we welcomed Alice Grahame and Kareem Dayes – two of the founding members of RUSS. Both are/were residents of Walter’s Way, the Lewisham housing project that continues to inspire RUSS and many other community housing groups. Alice Grahame (ex Trustee) currently lives in Walters Way and gave an insight into what life is like living in such a community. The units were completed in 1985: Alice was not one of the original self builders on Walters Way, (only 3 of the 13 self builders remain) but the community ethos continues to thrive and be strong. It appears that Walters Way is a huge success if you look at Walter Segal’s philosophy – people shouldn’t change themselves to live in a house, the house should adapt to them. The design of the houses encourages community living. The small road curves around the close, enabling most kitchens to look out into the communal area. Inside the houses internal walls can be moved to created new spaces and features are built for purpose and work very effectively for the occupiers when they wish to alter their home as their families needs change. Kareem Dayes (founder of RUSS, and ex-Chair) grew up on Walters Way. His journey into starting a Community Land Trust began when he noticed there were not any contemporary housing schemes that were relevant to the housing concerns we face right now. Lewisham Council were invited to Walters Way to encourage them to revisit the idea and address some of Lewisham’s housing needs. 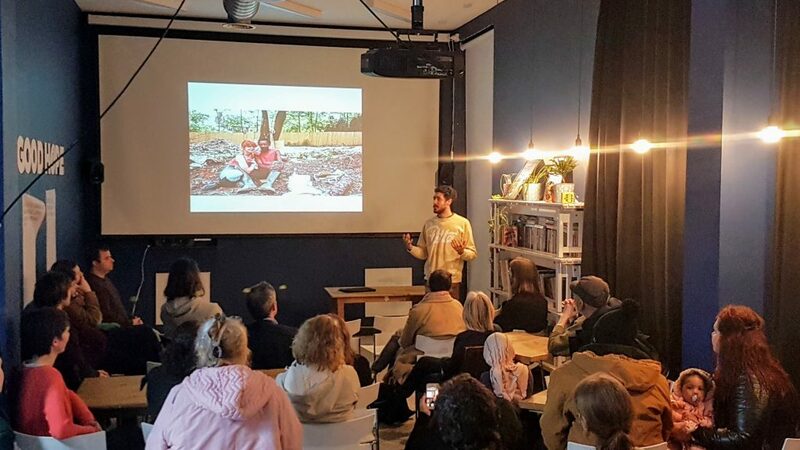 Unused land was located in Lewisham and after a number of years and long negotiations, RUSS secured the land using the positive arguments of social values, skills training and community leadership. Importantly, not drawing from the Council’s housing budget, exemption from the ‘right to buy’ policy and having mixed tenures were concepts that won RUSS the plot. Walters Way homes were built for £50-60k, and the last one sold for £750k. The difference with the Church Grove site (and future RUSS sites) will be that they won’t end up on the private market: this is at the heart of the idea of a Community Land Trust, and will ensure that they maintain a scheme that always remains affordable. Q – What opportunities are available for someone with no self-build skills but who wants to get involved. How can they interact with such a scheme? A – For building skills, the community hub – a single storey building at Church Grove will start to be built this year by volunteers. More widely there are roles in communication and training etc. Q – How efficient will the homes be? A – Passive house model, MvHR units will provide fresh filtered air into each home whilst making efficient use of heat energy. Solar power is being investigated. SELCE is a community energy company serving South East London – they can help with providing solar panels. Q – Has RUSS earmarked any other plots in Lewisham in thenext 5 years? A – Not yet, but our vision in the future is to locate other sites. 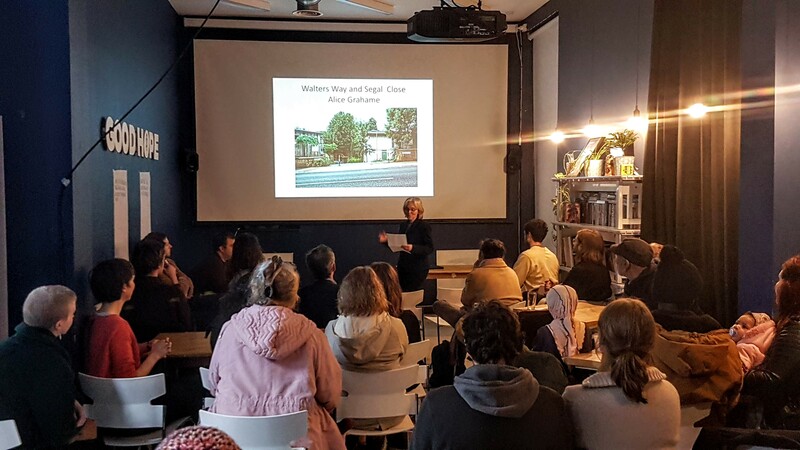 Walters Way was quite a ‘closed’ project, RUSS wants to try to be as open as possible –a Community Land Trust is not just about its members, but also about the wider community. Q – Are you building a skills bank? A – Yes there is a paper form available and also on the website to register your interest. Q – Why do you need members to join RUSS? A – To spread the word, as the more members sign up then the more power and momentum the group has. It also enables a group of people to share what is important to them in their community. Membership costs minimum of £1, and every £1 will buy you a share, which you can withdraw at anytime. The investment enabled RUSS to raise £20k, and is also good leverage for other funding, as it shows support from a wider community than just the residents. How do you experience the housing crisis or see it around you? What are your ideas for how it can be tackled? The great turn out and buzz created at this meeting showed a keen interest in RUSS from a wide group of people. 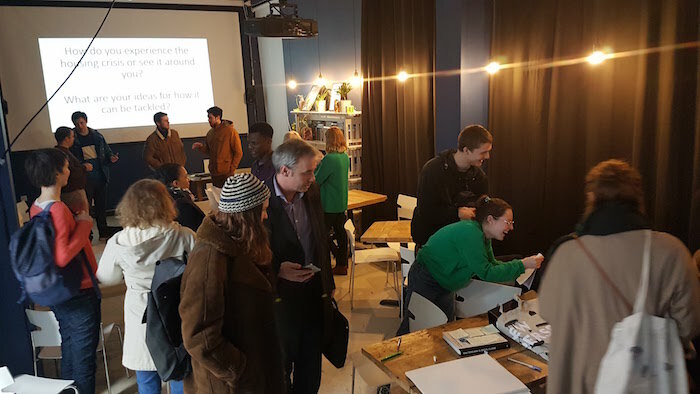 Some attendees were in the process of setting up their own Community Land Trust, others had heard about the event on social media and wanted to know how they could get involved. The common thread combining all of these people tonight was the recognition of a great housing need in Lewisham but also nationally. 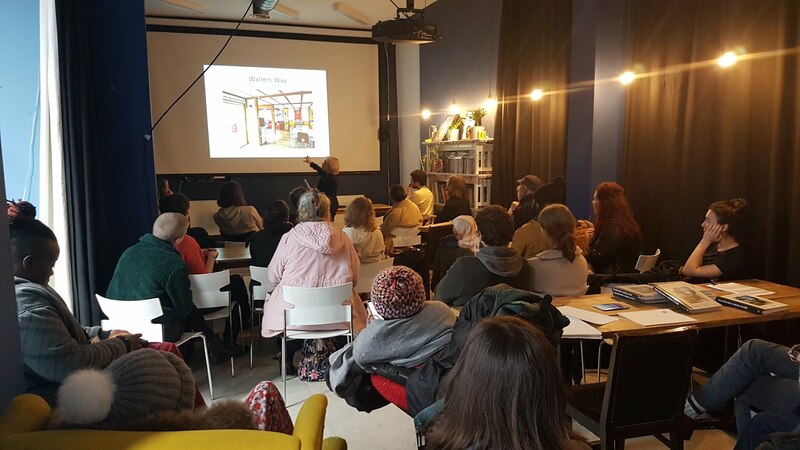 There have been many changes in the local community – some less positive than others – but there has also been an emergence of successful community run initiatives, ie libraries. A phrase that cropped up a lot was ‘power in numbers’ and tonight demonstrated a need for change and an appetite to forge forwards with an alternative solution. The more people know about RUSS and the benefits it can have to a wider community then the possibilities become stronger – spread the word. Community led housing is a long game, it is important to be willing to adapt as times change….much like the interior walls of a Segal house!